Colossal is a science fiction fantasy/dark comedy film directed and written by Nacho Vigalondo. Anne Hathaway stars as the troubled Gloria, who finds herself in a strange connection with a monstrous creature that begins attacking Seoul, South Korea. Dan Stevens, Jason Sudeikis, Austin Stowell, and Tim Blake Nelson also star in it. Composer Bear McCreary composed this score using two unique approaches. First, he approached the score through Gloria’s perspective and initially worked on the ending “Finale” piece(s) first. He produces unique rock that is combined with orchestra-style works. The string movements are beautiful and the pieces are fairly quiet overall, so boost your volume to fully appreciate those subtle changes, which are effective but not particularly memorable until the soundtrack’s second half. 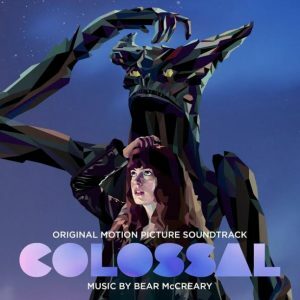 McCreary (The Walking Dead, Battlestar Galactica, 10 Cloverfield Lane) explores dark and reflective moods, which closely follow the resume of works he has produced for film, television, and video games. It’s original music that does not borrow from other “monster movie” scores – classic or modern. After first track “Colossal Prologue” sets a minimal tone, “A Monster Hypothesis” begins with piano pieces that require some imagination to produce some visuals (unless you’ve seen the film already), which is an interesting exercise in creativity. This second track then transitions into dynamic instrumentation including some crisp strings and eventually a full orchestra. The third track, “A Walk in the Park,” is a solid strings showcase, then “Jealousy” continues developing the strings and finally ends with a great keyboard movement. The fifth track, “Have a Beer,” shifts back to strings and then short, growling keyboard movements at the 1:15 mark, but only for about 10 seconds, which is unfortunate. This unique sound would have made a great transition to the next track or another one. The next track, “The Most Irresponsible Thing,” kick starts the soundtrack into the rock realm with driving rhythms and arrangements. It’s a rock song you could easily put some lyrics to – again, a nice opportunity for imagination here. The momentum continues with “Birth of the Monster” which has a powerful buildup, but the sensation doesn’t last for long. “Confronting Oscar” and “Separate Ways” continue the rock influence, but the ending tracks really impress and leave listeners satisfied. “The Colossal Finale Part 1” presents an epic, sustained set, while “The Colossal Finale Part 2” features more guitar. They are definitely my favorite pieces. This soundtrack is recommended thanks to McCreary’s inventive risk-taking – much like the film. Mondo will release a limited edition 180-gram vinyl version that features original artwork by We Buy Your Kids. This entry was posted in Music Reviews and tagged Bear McCreary, colossal, Film, Michael Siebenaler, Mike Siebenaler, Music, Tall Writer. Bookmark the permalink.